Ayen, E., Hasanzadeh, S., Tabatabaei, S. (2012). Defense cells profile of cervical mucous during follicular and luteal phases of estrus cycle in river buffalo. Veterinary Research Forum, 3(1), 45-48. Esmail Ayen; Shapour Hasanzadeh; Saleh Tabatabaei. "Defense cells profile of cervical mucous during follicular and luteal phases of estrus cycle in river buffalo". 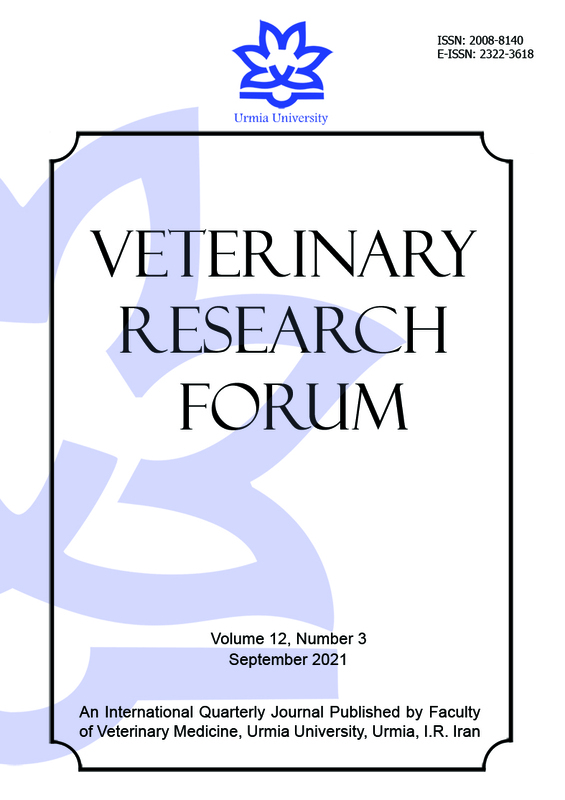 Veterinary Research Forum, 3, 1, 2012, 45-48. Ayen, E., Hasanzadeh, S., Tabatabaei, S. (2012). 'Defense cells profile of cervical mucous during follicular and luteal phases of estrus cycle in river buffalo', Veterinary Research Forum, 3(1), pp. 45-48. Ayen, E., Hasanzadeh, S., Tabatabaei, S. Defense cells profile of cervical mucous during follicular and luteal phases of estrus cycle in river buffalo. Veterinary Research Forum, 2012; 3(1): 45-48. The aim of this study was to evaluate the defense cells changes of cervical mucous during follicular and luteal phases of estrus cycle in river buffalo. Reproductive organs of the adult and apparently healthy female buffaloes were collected from the slaughterhouse. By visual investigation of both the ovaries for presence of corpus luteum and growing follicles, the luteal and follicular phase of each buffalo was specified. Cervical discharge samples were collected by sterile swabs and then spread over the glass slides, dried and fixed with methanol. The specimens were undergone Giemsa staining. The percentage of lymphocytes, neutrophils, monocytes (macrophages), eosinophils and basophils in each case (for both the follicular and luteal phases) were obtained at 20 microscopic fields. The percentage of lymphocytes, neutrophils and basophils in luteal phase were higher than the follicular phase. The percentage of eosinophils in follicular phase was higher than the luteal phase. The percentage of monocytes (macrophages) in luteal and follicular phases was nearly equal. The statistical analysis showed that the differences of all cells between follicular and luteal phase were not significant (P > 0.05). The most defense cells in discharges of external os of cervix (both follicular and luteal phases) were neutrophils and lymphocytes.